With the 2018 Season Finale for the Tri-C Karters club this weekend, CSK Racing is happy to announce its racing options for 2019. Just like this year, raceday rental packages will be $375, with Friday practice priced at $175 for the three afternoon sessions the day before. For lease drivers and VLR kart owners the tent fee for Friday will be $50, with the Saturday race day price set at $100, which includes all the same benefits as 2018: air-conditioned driver lounge, lunch, technical and setup expertise, basic consumables like fuel, as well as driver coaching from two of the best in the 206 business, Derek Esquibel and Mike Smith. 2019 will see even more one-on-one guidance as well, with both Smith and Esquibel trading in their helmets for coaching hats all day, as neither will be racing in the 206 classes next year. Instead, they will focus solely on helping customers achieve their best results, with the goal of a Senior or Masters 206 championship, bringing even more value to the CSK Racing tent program. As it was this year, the Lease Program for 2019 will provide drivers a brand new VLR chassis and 206 package with a Mychron 5 gauge, for those looking to commit to a full season of racing. The lease price for 2019 is 8 monthly payments of $330 from February-September. Lessees will be designated a kart which they will be the sole driver of, taking to each of the Tri-C races as well as any open practice day they want*. 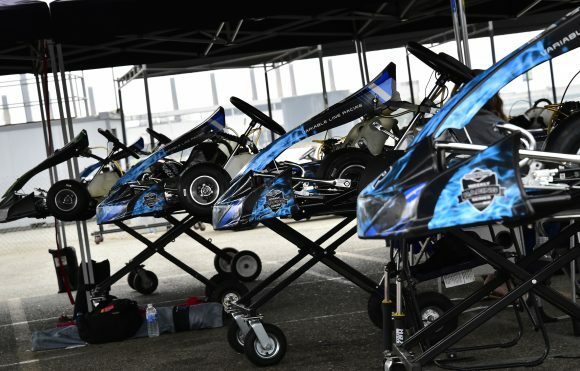 Storage is included in that price, while monthly maintenance will be charged at $60; this includes bolt checks, kart cleaning, gear changes, tire mounting, and other necessities to keep each driver ready to race. Anyone interested in coming on board CSK Racing’s lease program needs to do so by November 30th, allowing us enough time to get everything ready before the team test scheduled for January 12th. Kicking the season off right, Saturday, January 12th will be the first chance to get on course in the new season with the team, working towards a solid Tri-C season opener on February 2nd. Customers interested in renting or leasing from CSK Racing are encouraged to contact Team Manager Mike Smith at mike@calspeedkarting.com or by phone at 951-506-9363. Also, any VLR owners looking to get on board CSK Racing’s successful tent program can register a spot under the tent for the team test scheduled for January 12, 2019. Remember, CSK Racing is not only the So-Cal factory team for the VLR/206 package, but we also carry all of your VLR parts needs at the track! As always, if you have any questions please contact us, and we’ll see you at the track!